A wedding is one important event in a girls life. She wants to look the best on her big day. Her dress especially the Indian brides see to that it is all perfect and she stands out from the crowd. Right from the color of her saree to the intricate designs on her blouse all are given importance to the utmost. Now there are many a people who do wonderful blouse designs for these women and each blouse design supersedes the others. There are many types of work each with its own charm and grace. Elbow length maggam work & short sleeves maggam work designs :- Depends on the design you may need to choose the sleeves. Have a glance of the below maggam work blouse designs for elbow length sleeves and short sleeves. Based on your saree colour combination you need to choose the design on your blouse. Some times a simple design go good and it all depends on the design what you choose. Vanki design is one of the simple design and goes well especially for the wedding. 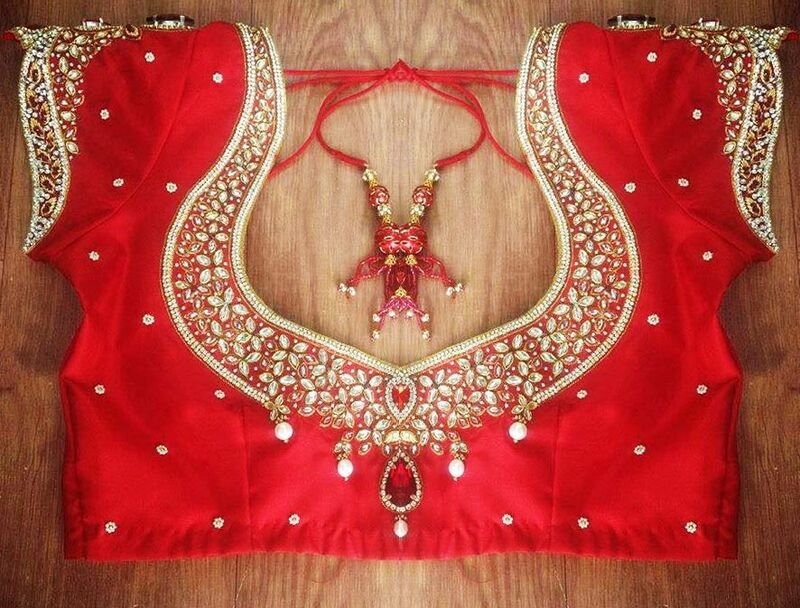 This blouse design is in such a way that for your wedding you may need not go for a vanki ornament that perfect design it self-shows a perfect ornament on your bridal saree. 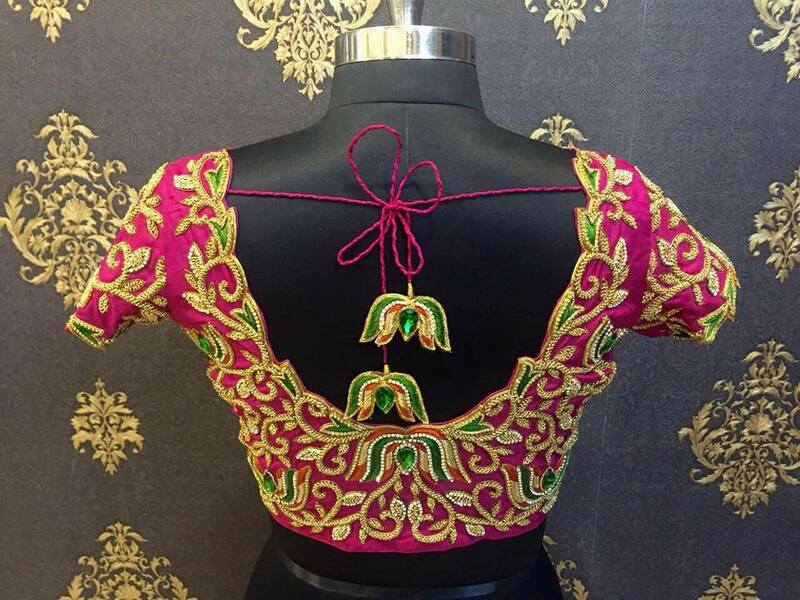 The online websites dealing with fashion design will make you get the amazing designs of blouse design that matches with your sari that you are going to wear during the special occasion. This article will help you find some of the beautiful blouse designs that will make you look stunning on the day of the wedding. Sari is the pride of the ethnic Indian dresses. There are cotton chiffon, silk and synthetic saris ranging from very simple plain saris to heavy wedding ones. 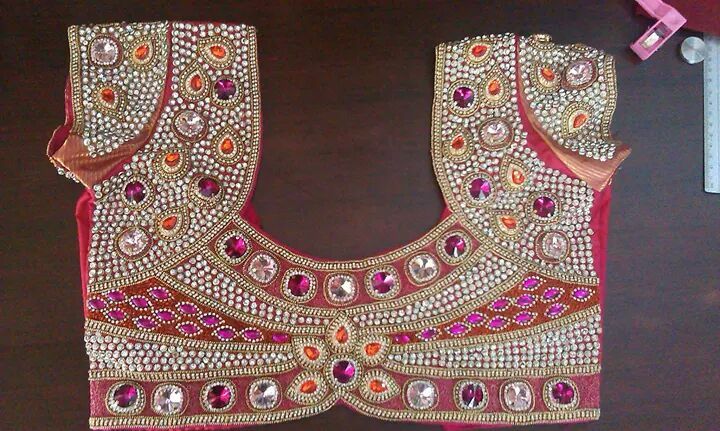 The designs of blouses for heavy silk saris for the wedding are in great demand these days. There are designer blouses made for silk, plain, satin, netted and wedding saris.